I don’t know about you, but I really like the photograph in my masthead. That’s likely not the proper term, but if you’ve read any of my posts you know I’m not great with technical lingo. This beautiful shot (the work of my neighbor, Dr. Joe Bridwell, a retired geologist and a world-class photographer) was taken in the Bisti/de-Na-Zin Wilderness in northwestern New Mexico, one of the eeriest, most beautiful places in a state loaded with scenic spots. Another Albuquerque author, Don Travis (dontravis.com), has written a mystery novel featuring the area. 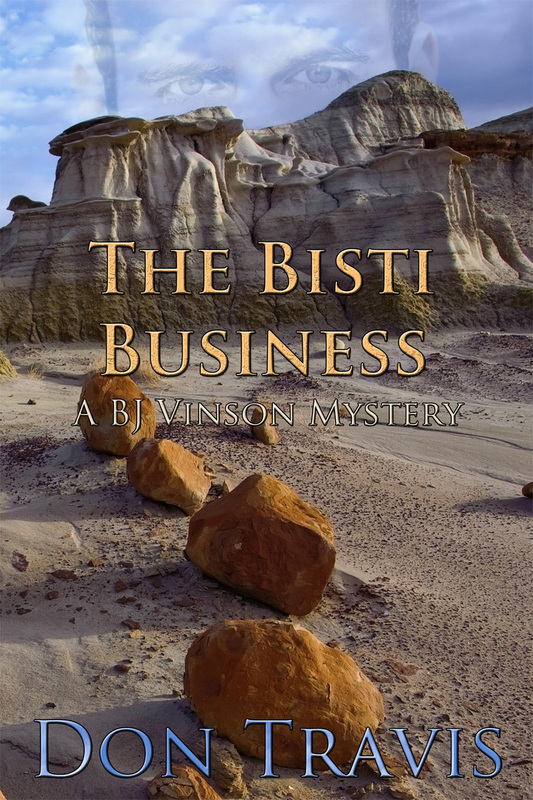 He has given me permission to show you the spectacular cover art for THE BISTI BUSINESS, (Martin Brown Publishers of Kokomo, Indiana) and tell you a little about the book. The novel is actually the second in a series featuring BJ Vinson, an ex-marine, ex-APD (Albuquerque Police Department), confidential investigator. The first book was THE ZOZOBRA INCIDENT. Perhaps he’ll let me feature Zozobra in a later post. Travis’s books tend to center on the State of New Mexico as much as they do the human adventures of his protagonist. I recommend them highly. When a phone call from a Napa Valley wine mogul sends BJ Vinson all over northern New Mexico in pursuit of an orange Porsche Boxster in the possession of his client’s son, Lando and Lando’s boyfriend, the hunt for a classic car suddenly becomes a frantic race against time to find two missing young men being shadowed by a mysterious stranger. After BJ watches the car plunge over the rim of the Rio Grande Gorge and fall 650 feet into the river below, he must follow a trail as twisted as the empty wreckage to a Navajo Reservation where some of Lando’s personal belongings show up without explanation. The discovery of a body in the Bisti-De-Na-Zin Wilderness area at the base of an eerie hoodoo is written off by the County Sheriff’s Office and the FBI as a drug buy gone wrong, but BJ isn’t so sure. To him, it looks as if the problem had its genesis in Napa Valley. Then Lando’s older brother shows up to help, and BJ realizes that while blood may be thicker than water, more will be spilled if he doesn’t find Lando before a clever and desperate murderer severs the Alfano family’s ties for good. Sounds interesting to me. Check it out. Thanks for taking the time to read and look around the site.